From Jesus Christ Superstar to the Gospel of Jesus’ Wife, from the Last Temptation of Christ to the Da Vinci Code, this generation has seen a radical alteration in our perspectives on key characters in early Christianity. Mary Magdalene has been transformed from a repentant prostitute to the first apostle. 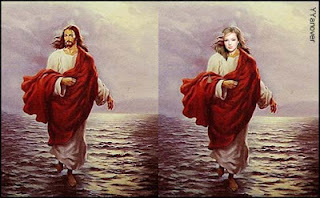 Now she is even Jesus’ wife. But is Mary’s rehabilitation rooted in reassessments of the primary texts or is it a product of our own immersion in popular culture? What do we know about her Gospel, her tomb, her family? The real story of Mary’s rejuvenation is so mysterious that it leads us to question the identity of the woman we thought we knew. It will be a fully illustrated talk (as long as we can get the powerpoint working) and it's tomorrow (Tuesday) at 6. I am also looking forward to speaking today in the Biblical Studies Colloquium on the topic "How reliable is the story of the Nag Hammadi discoveries". But I am of course most looking forward to catching up with old friends and colleagues in Birmingham! I have only just found out that one of the great New Testament scholars, Frans Neirynck, has died (Death notice here). Any scholar who had a three-thick-volume Festschrift is someone to be reckoned with. I suppose the thing that he will be remembered for more than anything else is the detail and accuracy of his scholarship -- his articles were meticulously researched and presented with great clarity. I never met Prof. Neirynck myself; he retired from the conference circuit at about the time that I was beginning to go to events. From what I hear, though, he was a formidable character and a mighty warrior for his favourite positions, especially the Two Source Theory and John's use of the Synoptics. More on Christopher Evans, including obituaries, here. In The Jewish Press, Yori Yanover adds this excellent picture of "that man" and "that woman" walking on water. I must admit that I am rather taken by this picture. Since the author of the article copies most of the content from John Finnegan's article in the Harvard Crimson without acknowledgement, I am sure he won't mind my reproducing his picture here. According to Kathryn Dodgson, director of communications at HDS, the publication is waiting to print King’s article while the papyrus undergoes scientific analysis. Once she receives the results of that analysis, King will incorporate them into the article for the Harvard Theological Review, Dodgson wrote in an email. Currently analysts are testing the ink on the fragment to confirm that it dates from the fourth century like the papyrus itself, which has already been tested. King could not be reached for comment on this article. There are also comments in the article from Greg Sterling, Janet Timbie and me. I'm sure many of my readers will have spotted the mistake in the title of the piece -- it's not "parchment". I had to get rid of my blogroll recently because a couple of blogs were getting flagged up by Google (incorrectly) as featuring malware, but then my automated links were being interpreted by Google as linking to the malware. Happily, these issues seem now to have resolved themselves and I've added by blogroll again on the right hand side of the page. As it happens, it is fortuitous because blogger has ironed out some problems with its automated blogroll delivery, and it seems that now all the biblioblogs (and related blogs) that I subscribe to are showing up, in order of the most recent to post at the top. I should perhaps mention again that there were several academic consultants involved in this project and I was one of them. More on The Bible Series here. I enjoyed taking part in the programme, but working with Skype was a little stressful as the connection went pretty blurry from about half-way through. 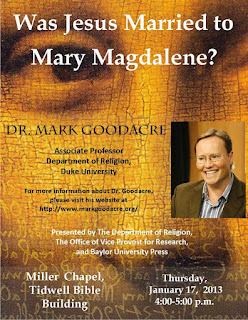 I'm lecturing at Baylor University tomorrow on the topic, "Was Jesus Married to Mary Magdalene?" They have put this nice poster together, which features details of time and location. I look forward to seeing some of you there. It is two hours long and stars Neal Arden as Paul. IMDb's page on the film is here: Life of St Paul (1938). 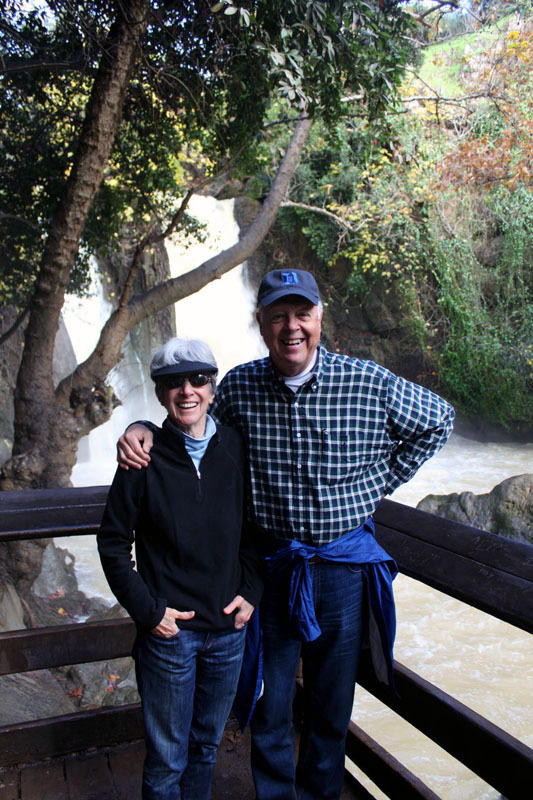 My colleagues Eric Meyers and Carol Meyers are once again leading a group of a students in an intensive study of Holy Land Archaeology. 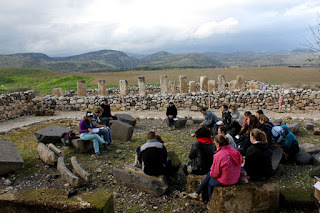 The photograph here is nicked from Ben Gordon, who is TAing on the tour, and it depicts the group gathered for the discussion by Iron Age storehouses at Hazor. 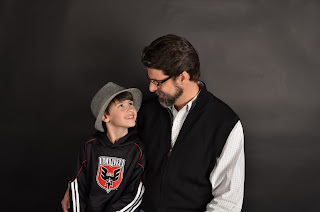 Our friend and fellow-blogger Christian Brady has suffered the unimaginable grief this week of the death of his son Mack. This morning, we are standing with him. If you get to listen to this programme, it's because the Domesday scenario - according to which the world would end on December 21st - did not happen. The interpretation of the Mayan calendar that arrived at this date was derided by most Mayan scholars, but this hasn't stopped the media camping out in the French village of Bugarach, identified as the only village on earth which was to be spared destruction. Apocalyptic ideas about the end of the world, as we in the West understand them, have their roots in the Jewish and Christian traditions. The popular imagery - the Mark of the Beast, the Four Horsemen of the Apocalypse, the Whore of Babylon - feed the imagination of film makers and writers, who draw upon Biblical imagery. Joining Ernie Rea to discuss the nature and role of apocalyptic ideas on western religion and culture are Dr Philip Alexander, Professor of Post Biblical Jewish Studies at the University of Manchester; Dr Stefan Skrimshire, lecturer in Theology and Religious Studies at the University of Leeds; and Rev Dr Steve Jeffrey minister of Emmanuel Evangelical Church in North London. It's a good listen. You can listen again at the link above, or you can download the podcast. The programme is thirty minutes long. However, one useful point is here clarified, that the tests are being arranged not by Harvard but by the still anonymous "owner of the fragment". For more on the fragment, including my own reflections on what I think is a forgery, see The Gospel of Jesus' Wife.